I call this grown up scones because the raisins are soaked in dark rum before cooking. The longer the raisins soak in the rum the more intense the flavor gets. The raisins will keep 8-10 weeks in the refridgerator so I make a large batch and have them ready. The recipe below is enough for 12 scones. Place the raisins in a small saucepan and cover with water. Bring to a boil then strain. Now place the raisins in a small bowl and cover with the rum and let it set for at least an hour. In your mixing bowl whisk together the flour, baking powder, granulated sugar, and salt. Toss in the cut up butter and place the bowl in the freezer for 10 minutes. Using the paddle attachment mix on low until the butter is broken up into pebble sized pieces (3 minutes). Strain the raisins reserving the rum. Add the raisins to the flour mixture and beat just once or twice and evenly distribute them. With the mixer still on low speed and add the 1/4 cup of rum and the heavy cream until the dough comes together. Using your hands, knead the mixure in the bowl until the dough comes together completely. Turn the dough out to a lightly floured surface and roll it into a 7-inch round – about 3/4 inch thick. Using a sharp knife cut in 12 equals wedges – like a pie. The wedges will look small but they will spread and rise in the oven! Place the pieces on your baking sheet at least 1/2 inch apart. Cover with plastic wrap and freee for 15 minutes. Preheat your over to 375. Brush the scones with heavy cream and spinkle with the Demerara sugar. 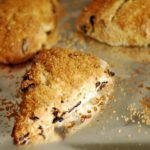 Bake the scone for 20 minutes turning the baking sheet halfway through. Transfer to a wire rack to cool. Serve warm.